A proposed five year Creative Rural Economy investment programme (2011 – 2016) including an initial two years of research and development, to assess the economic contribution made by creative rural communities and artists, and profile best practice in the emerging creative rural industries. This phase will be used to i) map out the characteristics of the emergent creative rural industries, ii) create an information network to support artists, designers and rural communities interested in the creative rural economy, and iii) flag the findings up to the statutory agencies (DCMS, DEFRA, Arts Council and Rural Community Council), for possibly taking forward as a further (three year) national creative rural economy investment programme. ‘..the arts and investing in rural creativity can make an immensely valuable contribution [to the rural economy], …and I firmly believe that the rural arts initiatives proposed here… not only for the individual businesses involved but also for the benefit of the wider rural community’. One of the main areas of development for the RCF lies in promoting the Creative Rural Economy, work that began with the Creative Rural Economy conference held at the University of Lancaster in September 2006. The aims of the conference were: (i) to identify the characteristics of the creative rural economy; (ii) to identify and describe models of best rural art practice ; (iii) to begin to assess the potential economic and social capital residing in rural communities; and (iv) to make recommendations as to the research and development required to support the Creative Rural Economy. At that time it was estimated that the likely contribution made by the rural to the national creative economy was around £500 million p.a. How was the figure of £500 million arrived at? The figure was based on existing research, extrapolation from other data, and anecdotal evidence, taking into account the numerous festivals, new media initiatives, and other cultural activities taking place in the countryside. From these one can say with some confidence that the rural sector (communities, farmers, artists, new media practitioners, and craftspeople living in rural areas) currently contribute in excess of £500 million p.a. to the national creative economy. This figure does not include estimates of the contribution from all the artists and creatives known to be active in rural areas, and does not include the equally significant contribution made by rural tourism, rural heritage, rural food and beverage outlets, and countryside recreational and sporting activities. 1. ‘The decorative crafts contribute an estimated £1 billion to national income; the [traditional] rural crafts, including the building trades, perhaps £300 – 350 million’, Crafts in the English Countryside report p. 7, (Collins/Countryside Agency, 2004. 2. ‘[Reportedly] the Glastonbury Festival generates around £75 million to the local economy but I would say it is closer to £100 million p.a.’. Michael Eavis, Dairy farmer and creative rural entrepreneur (2009). 3. ‘DCMS estimates that the urban creative industries contribute £60 billion annually to the national economy. Even calculating the rural sector’s contribution at just 1% of this total, would seem to support these figures’ [i.e. 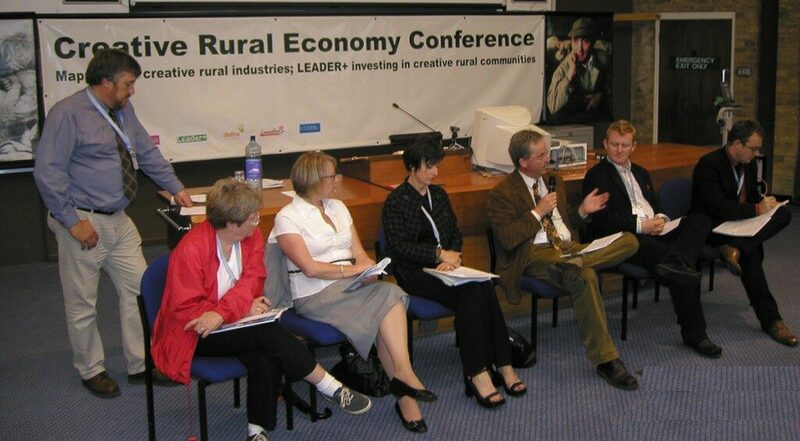 £500 million], Creative Rural Economy conference report, 2007. The RCF is concerned that current CI research methodologies, having originally been developed for use in urban contexts, seem to miss out on significant areas of the Creative Rural Economy. If the rural creative sector is to make its full potential contribution to the national economy there is a clear need for sectoral differentiation and the development of a more inclusive rural CI research methodology. The main urban creative industries, as identified by DCMS (Creative Britain report, 2008) and employed in current CI research, are: Advertising, Architecture, Art and Antiques, Computer and Video games, Crafts and Design, Designer Fashion, Film and Video, Music, Performing Arts, Publishing, Software, Television and Radio. While some of the above sectors also operate from rural areas, possibly generating a hitherto unnoticed contribution to the rural creative industries, the full extent of the contribution made by the rural creative sector to the national economy has never been differentiated statistically, or supported by independent research and systematic analysis. This presents two problems: (i) the contribution made by the rural creative economy to the national economy is invisible, and continues to be (mis)calculated as part of the urban sector contribution; (ii) in consequence the competitive edge and capacity for expansion of the rural sector is disadvantaged and, being invisible, rural creatives and rural innovation continue to suffer from under-investment and economic marginalisation. It therefore appears that conventional CI research methodologies, mainly urban orientated, fail to register the full dynamic complexity and creative potential of the emerging rural CI sector. One of the areas requiring study and statistical evaluation is the contribution to the national creative economy made by professional artists, craftspeople and designers (including architects, fashion and textiles, musicians, new media, theatre, film and video makers) working in the rural sphere. The RCF believes that this is likely to equal the £500 million estimate quoted above, but until a comprehensive study has been undertaken this will have to remain conjecture. ‘…the creative rural economy and environmental sustainability will be the likely key drivers in determining the next major breakthrough areas and challenges for the creative industries. We need to test this by… documenting and analyzing the new patterns of creativity and cultural employment across the urban-rural spectrum’. author of ‘The Creative Class‘. In part in consequence of the RCF’s pioneering work in the field and the Creative Rural Economyconference in 2006, a number of Creative Rural Economy initiatives have taken root in the Netherlands (Kasteel Groeneveld), Canada (Prince Edward Creative Rural Economy Initiative, Ontario), and Australia (ACRE – Australian Creative Rural Economy conference in Northern Victoria). The RCF is also in contact with, and advising on, similar initiatives now developing in Spain and in Sweden. Creative Rural Economy Centre of Excellence, and rural CI representation at future C&binet meetings? Britain now has an opportunity to take the lead internationally on research and development into the Creative Rural Economy. The RCF, and other researchers and consultants active the field, are developing a new area of expertise relating to the creative rural economy, that has the potential to become a new part of the knowledge economy, and is likely to be of value, and so exportable, to other countries worldwide. DCMS states its resolve to ensure Britain’s lead in the CIs by “working closely with key players across Government to address and monitor policy that affects the Creative Industries”, and by funding the establishment of a number of new regional Creative Industries Centres of Excellence. The recent establishment of the C&binet international CI network is a good example of how DCMS is influencing world leaders from the creative and financial industries “to help ensure that our creative industries continue to grow and thrive”(DCMS website, January 2010). The RCF would suggest that a modest CI investment programme should be considered, targeted at sustaining Britain’s world lead in the Creative Rural Economy. It would also help if (i) DEFRA were to be involved in future cross-Government discussions with DCMS about a creative rural economy initiative; (ii) a dedicated national Creative Rural Economy Centre of Excellence could be set up; and (iii) an invitation were included for UK rural CI representation at future C&binet planning meetings and conferences. The RCF is considering organising a second International Creative Rural Economy conference and exhibition/road show event in 2011. More details will be available on this site (under Events) in the near future.